In early September 1967, Zone chairman John Fry from the Whalley Lions Club suggested to Jim Lumby and Marv Boyter that there should be a Lions Club in North Delta. Prospective members were recruited by the three, with ten in attendance at the first organizational meeting held at Kennedy Hall on September 28, 1967. A second organizational meeting was held at Kennedy Hall on October 23, 1967. 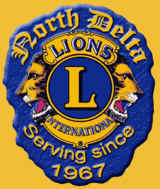 It was resolved by motion that the club be named the North Delta Lions Club, and would meet the second and fourth Mondays of each month, with the annual dues to be $20.00. The first regular meeting was held November 13, 1967 at the Dell Hotel in Whalley, where the first slate of officers was elected. The Charter Night was held November 24th, 1967 at Fernwood Acres with 25 members being chartered. Today four remain as members. The Club was formed in District 19A, later split with club being chartered in 19H1, and in 1970 was allocated in 19H4. The club has produced 6 Zone Chairmen, two of which won the coveted Multiple District Zone Chairman of the Year Award. Meeting places have consisted of the Dell Hotel, the old Firehall on Scott Road, Shum's Chinese Restaurant, East Delta Hall, Bas Thornthwaite's rec room, Sunbury Hall, and their current den at Kennedy Seniors Recreation Centre. Funds have been raised in many ways, with the first having been a dance at Sunbury Hall on April 6th, 1968 in partnership with the North Delta Soccer Club. Our share of the profit was $200.00. Some of the other means of fundraising over the years have included: dances, door-to-door sales (oranges, apples, light bulbs), raffles, flea markets, meat draws, break-open tickets, Ladies Diamond Night, Family Days at Annieville Park since 1968, Gaming Commission Bingos, etc. The first community project was to put a bus stop bench at the corner of 88th Avenue and Scott Road. Other club projects have been Christmas Hampers every year since 1967, purchase and installation of an adventure playground at Sunbury School, medical loan cupboard and many pieces of medical equipment supplied to Surrey and Delta hospitals, a car for a needy mother, 2 bunny busses to the Lions Society, an ambulance supplied to St. John's Ambulance Corps, sponsorship of an Air Cadet Squadron, 30 blood donor clinics, many camperships for needy children, constructed and donated $275,000 building at Kennedy House, Annieville North Delta Lions Park, the BBQ Centre, sauna at North Delta Aquatic Centre, and many donations to many worthwhile associations and causes.